Tiffany and Lupus: Case of the "Prednisone Blues"! I know it's bad news to be in a funky mood around the holidays, but lets face it! Lupus usually doesn't give a toot whether we've got a lot to be thankful for or even if we've been mostly good this year and Santa has promising treats around the corner. Last week while I was watching the wedding episode on Glee I burst into a fit of uncontrollable tears! Mostly because the wedding was so full of mushy emotions that lonely lupies tend to dream about. Especially me. I point blaming fingers at those nefarious lupus medications for most of those tear-jerking reactions! Just peeking at the side effects from one of them is enough to send most people into an epileptic fit! When I sit back and think about it; some of my scariest moments are when i'm battling the "Prednisone Blues". You know what I mean! Those moments when you feel like nothing will ever go right. When the uttered words "But you don't..." provoke colorful thoughts of violence. Like when you wonder if you're just destined to live alone with 50 cats and even more prescription bottles. Or when you begin to ponder where all those people you used to call "friends" have wandered off to. Yes, THOSE moments. 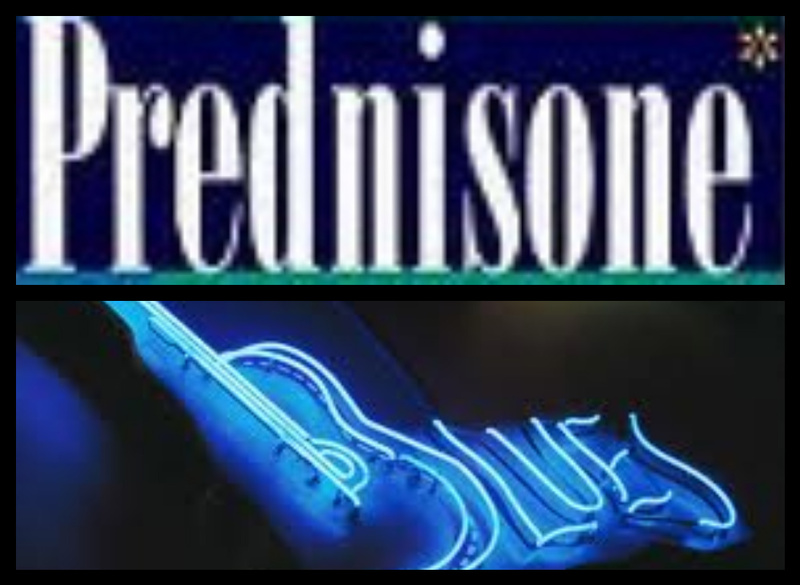 I like to call them the "Prednisone Blues" and as daunting as they may be there IS a way to get RID of them! While wobbling my swollen knees up the stairs to my bedroom my eye caught sight of an envelope in one of the stair corners. A devilish Cheshire cat grin that would put Alice in Wonderland to shame inked its way across my face! It was addressed from one of my lupus sisters that I met while on my self-discovering lupus journey this year. As I read her Christmas card the hairs on my arm began to rise, my eyes produced storm clouds and I wept. They were happy tears though. Her very words gave me the physical strength I needed to remind myself I WILL see another week. That I WILL make it to see next year. Her words gave me the sweetest comfort that I am NOT alone in my fight against lupus. That she is here fighting with me as I am with her. Who could have thought that words have healing powers! All it took was a simple letter to remind me that these "prednisone blues" ain't got nothing on my lupus sisters! So today I challenge you to spread some cheer this holiday season. To take out those dusty writing skills that have been forgotten in the frenzy of the e-world and WRITE a letter, MAIL a card, and send some magical mail through the post to a fellow lupie or any person who you'd like to know that you care about them. You'll be surprised at how much a piece of paper can brighten someones day! Let's not be slaves to the internet! It's time to take power into our own hands and make a little magic happen this holiday. This is my little way of nudging you on the shoulder & opening your eyes to something beautiful, something so much larger than just you and I. Let's start a chain of care; one that doesn't end with us but continues all around the until everyone has a bit o' magic in the mail! So remember to ask fellow friends whether they be local or on the web for their addresses so you can send them a special something. If you receive some "magical mail" you HAVE to send one out; those are the rules! Let's help heal each other! There is Magic in the Mail! Ha! Who says we're alone? Never! 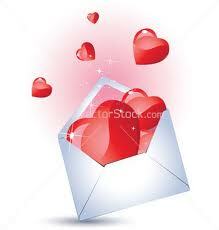 Love is right around the corner, sealed in an envelope of Magical Mail! I only hope the post man doesn't think us loony bin for pestering him missing mail! Well have you written a special someone yet? Get to it! Ready? Set? GO! You're so right! When I get a letter or card in the mail I get that same grin on my face. I hope that when I write to my fellow Lupie sisters that they feel the same way. What a lovely post! Am just now trying to remember which desk drawer I stashed my "thinking of you" cards in - can't wait to send them on their way. Thank you for the reminder! Here's hoping you've a great day and an even better tomorrow! @LilyKat I'm sure they will love it, it's nice to be reminded that you're not alone in the world! @Headstrong Thank you! Hope you're having a great day as well. good luck on finding your stationary! @Anonymous I'm so sorry that I have offended you! I never meant any disrespect. My 20 year old brother has a severe case of epilepsy and I have taken care of him since he was a baby, so believe me when I say I truly understand. He has seizures everyday of his life, even has a VNS right above his heart attached to his vagus nerve to try to stop the seizures which are out of control due to the left side of his brain being dead matter. I hope you accept my apology, I wish you all the best Dawn.